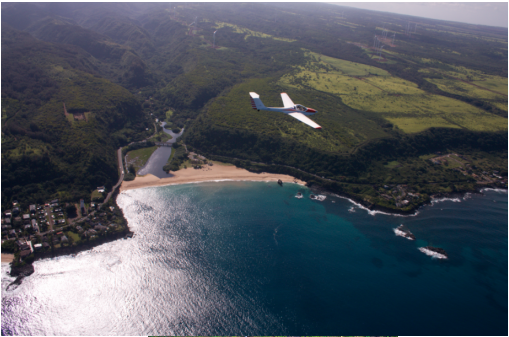 Your Flight - The Glider Connection - Come fly over Oahu's infamous North Shore in our gliders! After strapping into the spacious side by side seating in your Grob-109 motor glider, we will fire up the engine, close the canopy and take off for the nearby ridge. Moments later we are a thousand feet above Oahu's picturesque North Shore. Although the Grob’s engine is very quiet, once shut down the silence is surreal. We then soar on the wings of the wind!!! Back and forth over mountains, valleys, ocean and beaches this tour encompasses an area from the airfield to the westernmost point on the island, Ka’ena Pt. If you are game, you can take the controls and really feel the thermals keep you aloft. Fifteen minutes later we touch down where we started but with breathtaking memories. A video of your adventure can be purchased to show your friends and keep those island memories forever. Extend your glider flight by soaring over Mt Ka'ala, Oahu's highest point. Standing over 4,000ft (1,227m) this product of volcanic eruptions nearly four million years ago is part of the Waianae Range. On a clear (most) day you will see all the way to Pearl Harbor and the iconic Diamond Head. Continue onto historic Haleiwa, the gateway to the North Shore. Hawaiians settled in the Waialua, Haleiwa and Ko'olauloa Districts along the North Shore around 1100 AD and established villages along valleys, streams, and bays. Drawn to the area by the rich ocean waters and fertile lands dotted with natural springs, they grew taro and sweet potato. In 1832, Christian missionaries came to the area and built a mission and girls seminary in Hale'iwa. The town was expanded by wealthy businessman Benjamin J. Dillingham at the end of the 19th century when he built the Hale'iwa Hotel. Though it retains its old-time charm, nowadays it is an energetic tourist town with stores like Matsumoto's who have continuously served their delicious Shave Ice for 50 years. The 40 minute tour continues over the stunning Waimea Bay where top surfers come annually to ride some of the biggest waves in the world. Historically, Captain Charles Clerke stopped at here on 28 February 1779 aboard HMS Resolution. Clerke had shortly before taken command of the ship after Capt. James Cook was killed at Kealakekua Bay on the 'Big Island' of Hawaii. Waimea Bay was the only O‘ahu anchorage visited by the expedition. At that time Waimea Valley was densely populated and the remains of Pu‘u o Mahuka, an important heiau (Hawaiian temple) can still be seen above the bay. After your flight this is one of the most beautiful beaches on the North Shore to relax and take in the Hawaiian sun. The Ultimate Tour takes you all the way from Ka'ena Point to Kaneohe Bay. Along the way we will see the top surf spots on the North Shore: Banzai Pipeline, Backdoor, Sunset Beach & Velzyland to name a few. We will fly over the beautiful Turtle Bay & Polynesian Cultural Center and down the Koolau Range where you will see O'ahu's best waterfall nestled in the mountains. Following a tragic accident Sacred Falls is closed to the public so the only way to see it is by air. It is the largest series of waterfalls on O'ahu totaling 1519ft. There are more than 10 distinct drops with the two largest being 300ft and 510ft. Other jewels of this tour are Mokolii Island, more popularly known as Chinaman's Hat, Kualoa (long back) Ranch where many motion pictures and TV shows have been filmed including LOST,Jurassic Park and 50 First Dates. Only from the air can you see where it gets its name. It was considered one of the most sacred places on O'ahu and the training ground for the children of the most powerful ali'i (chiefs). Legend has it that the fishponds of the area were built by Menehunes (Hawaiian Leprechauns) who predated the Polynesian settlers. We turn around at Kane'ohe Bay, the largest sheltered body of water in the main Hawaiian Islands. The site of the first attack on Hawaii on Dec 7, 1941, and the first Medal of Honor recipient of WWII, this bay is now home to Kane'ohe Naval Air Station.